18 year old Dorothy lived with fistula for a year and was operated in May 2017. Dorothy dropped out of school because she was pregnant and the man who impregnated her left her while she was two months along. Dorothy did not receive antenatal care as she lived quite a distance from the nearest clinic. During the pregnancy Dorothy noticed her legs were getting swollen and within just a few days she was palletized. Her parents rushed her to the nearest hospital and when the doctors operated they found the baby had sadly died two weeks previously and had started to produce toxins which were affecting Dorothy's health. After the operation Dorothy noticed that she was leaking urine. After 5 months Dorothy’s legs finally started to function but she was still being stigmatized by the people in her community. Following surgery at our Fistula Care Centre in Malawi, Dorothy is now fistula free. She attends community events, visits her local mosque and is planning to go back to school in September to start Standard 6, since this was the class she dropped out of. 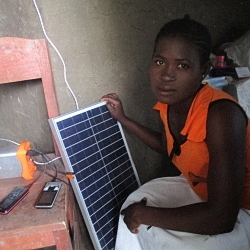 While recovering Dorothy was privileged to receive a solar business unit in June 2017.